Does a stay-at-home parent need life insurance? When you think about the family provider, most people’s minds go to the parent that brings home the bacon. It’s obvious that this person needs to have life insurance. Term insurance is affordable and structured to provide income replacement if the loss of a provider happens unexpectedly. Without this provider, the family would struggle financially. An income is how one pays for a home, car, bills, children’s school activities, food, and clothing. So, if a family has one parent working outside the home and one stay-at-home parent, they only need to have the breadwinning parent covered, right? Wrong. These are just a handful of the services an average stay-at-home parent provides each week. You could even add teacher, psychologist, and accountant to their job title. 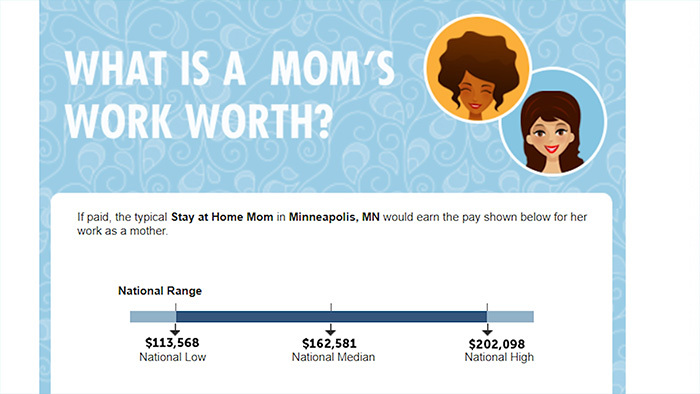 Salary.com estimates the average stay-at-home mom is worth an annual salary of $162,581. That’s a lot of money to make up for if a stay-at-home parent were no longer around. Not only do income providers need life insurance, but stay-at-home parents need it as well. The average stay-at-home mom is worth an annual salary of $162,581. That’s a lot of money to make up for if a stay-at-home parent were no longer around. Not only do income providers need life insurance, but stay-at-home parents need it as well. How Much Coverage Does a Stay-at-Home Parent Need? It makes the most sense for a stay-at-home parent to have enough term life insurance coverage to last until all the children are at least 18. If you plan on paying for your children’s college education, the coverage should be a longer term. Calculating the amount of term life insurance on a stay-at-home parent can be a little tricky with life insurance carriers sometimes. Carriers have rules on how much life insurance coverage an individual can own. Life insurance isn’t designed to increase wealth. It’s not an investment tool; it’s mainly to replace income. For example, if you make $30,000 per year, the life insurance company is going to question your application if you apply for a $10 million dollar insurance policy. The life insurance companies do not want insured clients to essentially be worth more dead than alive. As a general rule of thumb, many insurance professionals advise you to have 10 to 20 times your current income to maintain your loved ones’ standard of living. Because stay-at-home parents do not generate income, on paper it’s difficult to determine how much coverage they can be approved for. Most life insurance carriers would allow a stay-at-home parent to have coverage equal to that of the breadwinning spouse. If the breadwinner makes a substantial amount of money and has a substantial amount of life insurance coverage, carriers may cut the coverage for the stay-at-home parent in half. Example: One carrier may follow the guidelines that state if the income-earning spouse has $3 million or less of life insurance coverage, they will approve the stay-at-home parent for the same amount. If applying for more than $3 million, the financial underwriters will consider approval on a case-by-case basis. Sometimes in order for a stay-at-home parent to be approved for the coverage they applied for, information must be sent to the insurance company to explain why the client is hoping for that coverage amount. This is one example of why working with an agency that has years of experience is beneficial. They know what the insurance company requires. It’s also important that the agency have access to more than one life insurance carrier. While one company may deny a specific amount the stay-at-home parent applies for, another carrier may not have any issues with it. Stay-at-home parents are the unsung heroes of the household and need life insurance coverage just as much as the breadwinner. Quotacy works with many of the best life insurance carriers, and we will work closely with you to get all the facts so you get the best coverage possible for your individual situation. Whether you work in or outside the home, if you have anyone who depends on you, life insurance should be in your financial plan. Term life insurance is typically known as income replacement, so it’s a common misconception to think that because the stay-at-home parent does not provide actual income, that this person would then not need life insurance. And this couldn’t be further from the truth. One parent often stays home with children to not only spend quality time with them but because paying for daycare is expensive. 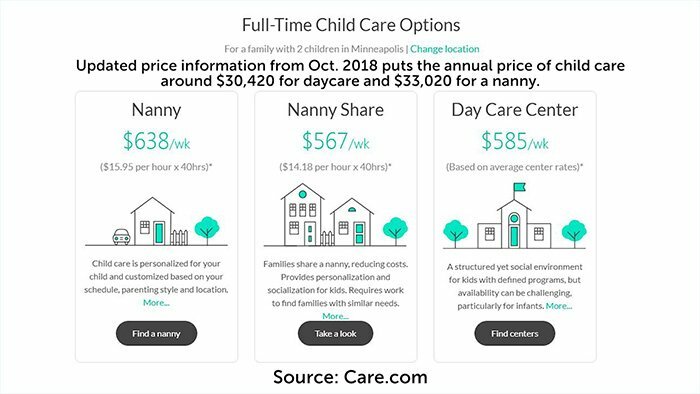 Quotacy is located in Minnesota and here in Minneapolis the average annual cost of daycare for two children is $24,570 and the cost of hiring a nanny is $26,838. For many people, that could be more than half their annual income and many families decide it’s not even worth both parents working if such a high percentage of their money is just going toward someone to stay home with their kids while they’re at work. Thinking about just daycare alone, if a stay-at-home parent were to die unexpectedly, the surviving parent needs to find an extra $24,570 per year. The surviving parent will also need to find time to transport to and from school activities, grocery shop, cook meals, clean the house, and do laundry. Or simply hire someone to do these things. If they can’t hire someone, they will need to do these things themselves on top of their current job. 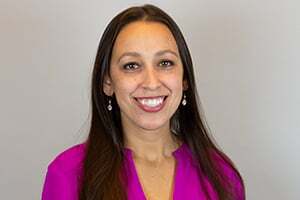 Should a stay-at-home partner pass away the life insurance death benefit could cover the cost of the funeral and provide funds to hire a nanny, pay for a housekeeper, or help cover school tuition. Salary.com estimates that the average stay-at-home parent is worth an annual salary of approximately $162,000. So, if the rule of thumb of life insurance is to buy ten times your annual salary, the average stay-at-home parent should apply for $1.62 million then, right? Because a stay-at-home parent does not generate income, on paper it’s difficult to determine how much coverage they can be approved for. And before a stay-at-home parent can apply for life insurance, their spouse needs to have life insurance as well. Life insurance companies require that the working spouse have at least the same amount of coverage that the stay-at-home parent is applying for. If the working spouse makes a substantial amount of money and, therefore, a substantial amount of life insurance, insurance companies may cut the coverage in half for the stay-at-home parent. So, as an example of this, let’s say John Smith owns a successful business making over $100,000 a year and has a $2,000,000 life insurance policy. 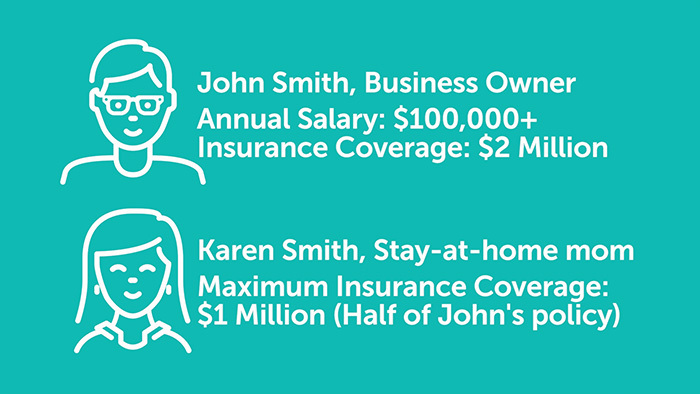 Most life insurance companies would then only approve $1,000,000 in coverage for John’s stay-at-home spouse. The amount of life insurance you apply for needs to be justifiable. A life insurance company doesn’t want a person worth more dead than alive. Whether you’re a working parent, divorced parent, single parent, or a stay-at-home parent, if you have children, then you need life insurance. If you have any questions about life insurance make sure to leave us a comment. Otherwise, tune in next week when we talk about getting life insurance without a medical exam. Bye! Very interesting post. Stay at home moms do provide a valuable service to the family and her contribution would be sorely missed. This is all the more reason for women to consider buying life insurance on themselves and why it is important to the family.